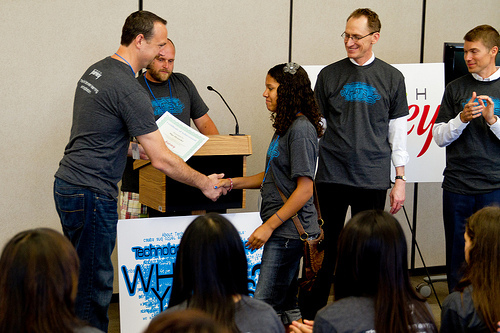 An awards ceremony capped last week’s Tech Camp at Central Campus. Tech Camp 2013 wrapped up last Thursday at Central Campus, in the building that used to house Tech High School, home of the Engineers. But this was not about the past, no way. In fact nothing could be further from it. Tech Camp is all about what comes next. Both found support at their workplaces and their employers reached out to identify other corporate partners. Eventually the idea was carried to the attention of Deb Mishak, the DMPS Gifted and Talented Coordinator. It sounded like an answered prayer to her; just the sort of public/private collaboration the district is always seeking, particularly as its emphasis on STEM (science, technology, engineering and math) programming grows. And so Tech Journey was born, a nonprofit “aimed at inspiring young people to take an interest in technology by offering an engaging learning opportunity,” as the organization’s website puts it. Besides Principal and Source Allies, other corporate supporters jumped aboard including Bankers Trust, Visual Logic, Mumo Systems, Edward Jones, FBL Financial Group, Signature Consultants and Verizon Wireless. The 8th graders who participated this summer are being viewed as Tech Camp’s first class and they’ll all be invited back as they advance through high school. Principal donated the laptops that were at their disposal last week and will continue to be for in-school use. Where does Tech Camp go from here? Straight ahead and straight up – into a future that promises to be as bright as everyone connected with it can imagine – yeah, that bright.